The government’s boat turnback policy is leaving thousands of refugees to rot in Indonesia. They are struggling to survive and have no hope of a future, as next to none will get the chance of resettlement. Refugees from across Iraq, Afghanistan, Burma and even Somalia travel through Indonesia looking for a safe country. Neither Indonesia nor the countries they travel through to get there, like Malaysia and Pakistan, are signatories to the Refugee Convention and do not permanently resettle refugees. The government’s “Operation Sovereign Borders” has blocked the way for refugees to travel by boat from Indonesia to Australia. Their only other option is to wait for a country to offer them a place through their official government-sponsored resettlement program. Before 2013, Australia was also the country that resettled the most refugees from Indonesia through its official program. Under this official humanitarian program it will accept 18,750 refugees this year from refugee camps offshore. However, who makes up that number, and which countries they come from, is at the whim of the Immigration Department—and ultimately the Minister Peter Dutton. If the government was serious about assisting refugees, and saving lives at sea, it would boost resettlement from Indonesia so there was another pathway to safety for refugees stranded there. But in recent years, both Australia and the US have dramatically reduced how many refugees they take from Indonesia. The Australian government announced in November 2014 that it would no longer accept any refugees who applied for resettlement through the UN in Indonesia after 1 July 2014. At the time that meant that nearly 2000 asylum seekers registered with the UNHCR in Indonesia between 1 July and the announcement in November would never be resettled in Australia. Not only has the Coalition banned any refugee from settling in Australia who comes by boat. But under these changes those registered with the UN refugee agency in Indonesia, who would be flown to Australia, are also banned. When the ban was announced, then Immigration Minister Scott Morrison stated, “We’re taking the sugar off the table, that’s what we’re doing. We’re trying to stop people thinking that it’s okay to come into Indonesia and use that as a waiting ground to get to Australia”. But what that means for the thousands of refugee and asylum seekers is that the Australian government has taken hope for a secure, safe and happy life off the table. So as the number of refugees and asylum seekers stranded in Indonesia grows, their chances of being resettled are slim. But for a lot of them it is too dangerous to return to the home from which they initially fled. Consequently, around 14,000 refugees and asylum seekers are currently left stranded. Last year the UN refugee agency began telling them that, with so few countries offering places, “most refugees in Indonesia will not be able to benefit from resettlement”—ever. In Indonesia they have no rights to work or to study. For many this is the end of the line—their money has run out. Homelessness is high. And people are relying on small NGOs for their basic needs. Unable to work and with nothing to do to pass their days, refugees have literally nothing to do but wait for resettlement, if and when it will ever come. Mozhgan herself has been in Indonesia for over five years. Indonesia also runs 13 detention centres, with capacity for 1300 asylum seekers. Some have been expanded with money from the Australian government. 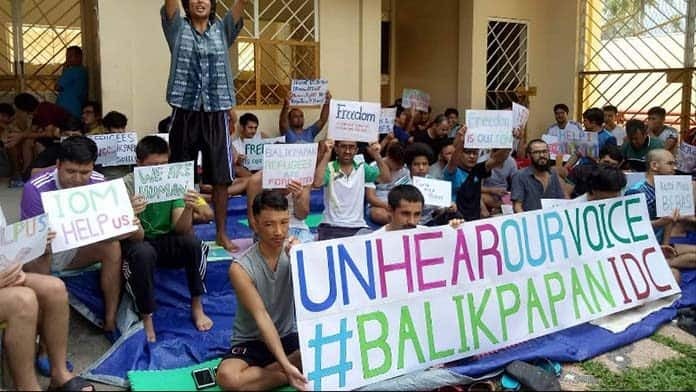 Refugees in the Balikpapan prison in Kalimantan have been protesting for over 200 days against their conditions and demanding to be released into open social housing. This situation of refugees in Indonesia shows the hollowness of governments’ claims that ‘stopping the boats’ is for the safety of the refugees. There is nothing safe about forcing people to choose between remaining in limbo or returning to the dangers they’ve fled. Refugees cannot survive in Indonesia. Stopping the boats doesn’t save lives—it just forces refugees to die somewhere else. We should open the borders and bring them here.